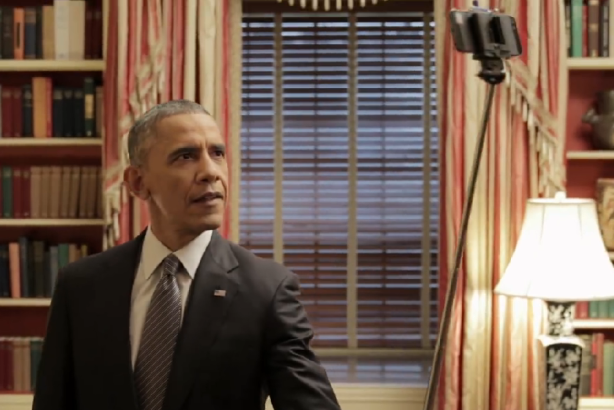 BuzzFeed filmed Obama doing things we all do but won't admit, such as using a selfie stick or checking himself out in the mirror. President Obama’s effort to promote enrolling for insurance plans through Healthcare.gov by the February 15 deadline is his most out-of-the-box communications stunt since his appearance on comedy show Between Two Ferns last year. Following an interview with the president, BuzzFeed released a video on Thursday in which Obama does things we all do but won’t admit, such as using a selfie stick, checking himself out in the mirror, and doodling pictures of his crush (first lady Michelle Obama). He also commandeers a sarcastic phrase used to blame the president for inconveniences, "Thanks Obama," when a cookie is too large to dunk in his glass of milk. His "Can I live?" remark at the end of the video may have even been a callback to Kim Kardashian. The humorous video is an unprecedented use of social media by a politician to reach young people, but it’s not a stretch for Obama. In March 2014, his satirical interview on Funny or Die’s Between Two Ferns contributed to a significant uptick in Healthcare.gov visits. His comms team has also experimented with social media platforms including YouTube, Vine, and Medium. Now other politicians are trying to get in on the unconventional communications tactics – look no further than Sen. Rand Paul’s (R-KY) Snapchat interview last month. "He might be president, but he’s also human!" BuzzFeed points out at the close of its post recapping the video, a fact that was also demonstrated when POTUS responded to hecklers during his State of the Union address last month. Along with the light-hearted video, Obama gave an interview on Tuesday to BuzzFeed editor-in-chief Ben Smith, covering issues such as the Affordable Care Act, Russia, drugs, and LGBT rights. At this point there’s no ruling out what communications methods the president has in store. 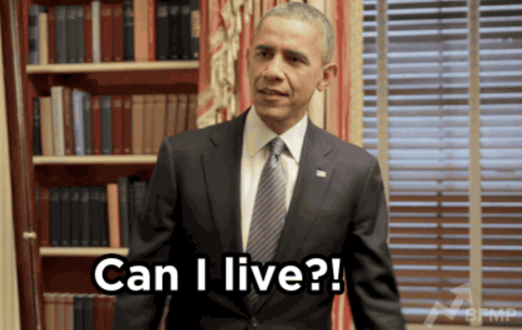 Of course there were critics – The Washington Post ranked BuzzFeed’s Obama GIFs by which "diminishes the presidency the most." But like it or not, the video was viewed more than three million times in less than three hours.